Much like most things in the world, candy is not a one-size-fits-all indulgence. While it may be a near universal truth that everyone loves candy, counting at least one treat as a go-to favorite that always tastes as good as the first one they ever enjoyed, many of us have dietary restrictions that allow for us to only eat certain foods, baked goods and candies. These restrictions, including that foods must be sugar free or gluten free, apply to not only many adults, but many children as well. Too Tarts Sugar Free Drops – Somehow candy is even more exciting and enjoyable when it comes in a fun container, and these sugar free Too Tarts certainly do! Each bottle of this “Sugar Free Candy With Attitude!” packs just 7 calories and plenty of fun. Each box of 36 contains 3 flavors – Blue Bewwy, Gween Apple and Straw Bewwy. Sugar Free Twizzlers – One of the best warm weather candies there is, we’re excited to offer Sugar Free Twizzlers, which are just as dee-lish as the original. This generously-sized 5 oz. bag holds 16 strawberry Twizzlers – more than enough to last a few extra innings! 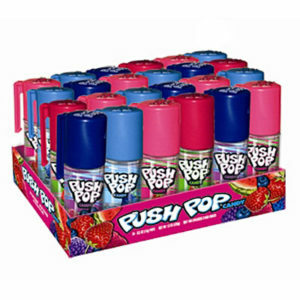 Push Pops – The wrappers may have received an update over the years, but the classic container of Push Pop lollipops is immediately recognizable. A favorite for more years than I care to count, these make a nostalgic candy treat for adults, and are just plain fun for the kids. And if you’re enjoying one in the dugout and it’s time to play ball, you can simply snap the top back on and pick up where you left off later – smart and sweet! Air Heads Taffy – Another candy classic that I loved as a kid, Air Heads are just as awesome today as they ever were. Blair Candy offers Air Heads in boxes of 36, with the following fruity flavors to choose from: Cherry, Strawberry, Blue Raspberry, Sour Apple, Watermelon, Green Apple, and the most fun of all – White Mystery. What flavor will White Mystery be? Only a taste will tell! Wishing your team and your concession stand the best of luck this year! Concession Candy Favorites are MVPs at Blair Candy: Part 2 – The Salty Snacks! 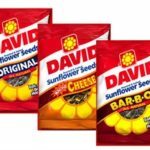 David Sunflower Seeds – You’d have a tricky time finding a well-stocked concession stand that doesn’t offer this classic snack. When I was a kid they were only available in ‘Regular’, or at the very least that’s the only variety I ever plopped my pennies down for. Today, BBQ, Nacho and Ranch flavors have been added to the sunflower seed family, and I can’t help but think that if they were brothers and sisters they would get along famously! Each is delicious in its own way, but when the bases are loaded and my excited energy is at its peak, I’m a ‘Regular’ girl reaching for a handful of the comforting classic! Shredded Beef Jerky – I carried a pack of shredded beef jerky so often as a child that it’s a wonder my jeans never developed a worn circle where it sat! To this day it’s one of my favorite salty snacks, and works well as a protein-packed pick-me-up for long days at the office. But it’s at the baseball game that shredded beef jerky looks most at home, in the hands of the fans on the bleachers who will always root for the home team no matter that season’s score. are one of the best ways we know to satisfy your spicy tooth! 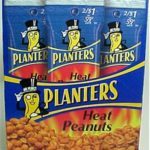 With Planters, you always know your getting the best peanuts on the planet – their name didn’t become synonymous with ‘peanut’ without good reason! You also know they won’t be gathering dust on the concession stand shelf as they’re a time-tested treat that never gets picked last. 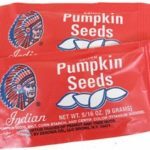 Indian Salted Pumpkin Seeds – If David Sunflower Seeds have a best friend, it surely lives inside this familiar red paper pack. For serious salt-lovers only, Indian pumpkin seeds are as close as it gets to pumpkin seed perfection outside of roasting and salting them yourself straight from the pumpkin. I still remember my salt-pursed lips as a kid, which always gave away the fact that I’d eaten two packs! Much like the shredded beef jerky mentioned above, pumpkin seeds are also naturally high in protein, giving you some extra oomph to get through the game! Concession Candy Favorites are MVPs at Blair Candy: Part 1 – The Sweet Snacks! As baseball teams across the country lace up their cleats once again and take to the field for that most American of all sports, BlairCandy.com also gets our starting lineup ready! We offer concession candy all year round, but when spring breaks we make sure our shelves are filled with our star players. Whatever spring sport you’ll be stocking the concession stand for, we’re confident you’ll find your flavorful favorites in our selection! We also offer a great selection of concession stand supplies at great prices, including hot dog containers, French fry paper trays, straws, plastic nacho trays and raffle tickets! 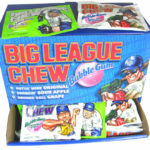 Big League Chew – This pouch of juicy perfection has been a favorite since it hit the stands, and its fans have never looked back. To chew it is to love it, with its unique form and mouth-watering deliciousness. Plus…it’s just plain fun! 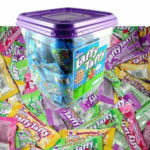 Laffy Taffy and Laffy Taffy Ropes – It should be known by all who were once a kid that taffy at the concession stand is an absolute must! When my friends and I would go to local games to see our friends play, we would let the taffy sit on the metal bleacher for 5-10 minutes in the sun before we opened it up. Softening Laffy Taffy was, as far as we were concerned, precisely what the sun and metal bleachers were made for. When you peeled back that wrapper, it was sweet candy strings of amazingness stuck to the wrapper, and a warm piece of wonderful in the middle. Sure, it was messy. But somehow that never really bothered us. At all. 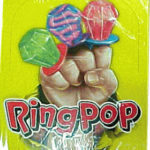 Ring Pops – Just as tasty as they ever were, there’s something special about Ring Pops that only a few other candies can capture in my memory. The moment I slip the open-backed band onto my pinkie, I’m instantly taken back to a particular moment in my childhood, the moment of my first or at least favorite Ring Pop, sitting and smiling on my front porch on a sunny summer day while the neighbor kids and I dug into our brown paper bags, a fresh haul from the corner candy store. I think it has something to do with Ring Pops being something you taste and wear – they appeal to multiple senses, making them last longer in your mind, tying them for eternity to ‘where you were’ when you had your first one. When you sell them at your concession stand, consider that each Ring Pop you sell just might be the one that kid remembers the most! I’ve eaten hundreds of Ring Pops in my life, but that one on the front porch of my childhood home is the one I remember best, and the one that makes me smile every time and keeps me coming back for more. 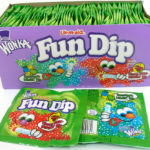 Fun Dip – While the kids you’re selling this longtime concession candy favorite to might only know it as Fun Dip, you might remember it the way I do – as Lik-m-aid! And that little white candy stick inside, which just might be the best candy ever and SERIOUSLY NEEDS TO BE SOLD ON ITS OWN (Yes, I’m talking to you Wonka…please!!! ), well that white candy stick was the Lick-a-stick! Or, as old school Lik-m-aid Fun Dip came with 3 packs of sugar and two candy sticks, they were Lik-a-stix. Ringing a bell? I hope so! Whether you remember them as Lik-m-aid, or they’ve always just been Fun Dip, this is one of the best concession candy choices of all time, and we don’t think that will be changing any time soon! Gardners Candies – Chocolate Easter Eggs for Every Taste! Looking for that super special Easter treat for yourself or a loved one? That chocolate wonder that will have them staring wide-eyed with anticipation for the bounty their taste buds and belly are about to receive? When only the best will do, consider Gardners candies! Gardners Peanut Butter Meltaway Egg – That’s right…a full pound of nothing but chocolate, peanut butter meltaway, and a perfectly-sweet candy flower on top. The peanut butter meltaway egg is a great choice for just about everyone of all ages – who doesn’t love peanut butter?! Gardners Chocolate Fudge Nut Egg – Do you think the only way to improve upon chocolate is to add more chocolate? Well, how about adding more chocolate and nuts? Thought that might get your attention! This fudge-filled chocolate egg is sizable enough to share, but we certainly aren’t going to tell anyone if you decide to hide it in back of the pantry or refrigerator instead. Because one of us might be doing the same thing. And one of us might be me. And one of us might be hoping no one with a key to my house is reading this. Want even more Gardners candies to choose from? You’re in luck! In addition to the varieties outlined above, we also offer: Cashew Meltaway Eggs, Coconut Eggs, Fruit and Nut Eggs, Maple Cream and Nuts Eggs, and All Nut Eggs, with roasted cashews, almonds, Brazil nuts, pecans and walnuts. We’re sure to have the most egg-celent option for everyone’s Easter basket!